Congratulations to the Orange Family History Group newspaper indexing team. 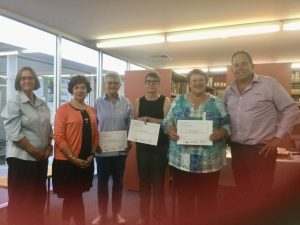 They have been working away adding entries from the Central Western Daily into Central West Libraries online catalogue since 2009. They have now added over 165,000 records – Births, Deaths, Marriages and Probate Notices. which are searchable by anyone researching local and family history and goes from 1945 to date. This has already proved to be an invaluable resource for researchers. Photo: Ros and Jan from Orange City Library with Jenny, Lynne and Julie from Orange Family History Group and Scott from Orange City Council.